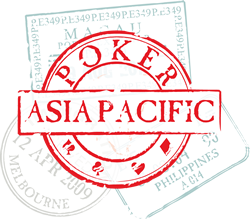 Poker Asia Pacific is a poker news and information portal. The website www.pokerasiapacific.com does not operate, host or directly promote online gambling services. Poker Asia Pacific and its owners are not responsible for any gambling losses incurred by visitors to its website. Visitors understand that gambling is a risk and accept that responsibility. We endevour to provide accurate information, but we do not accept responsibility for any erroneous or missing information. Poker Asia Pacific provides RSS feeds which may be installed without prior written permission.